Use SmartAsset's mortgage comparison tool to compare mortgage rates from the top banks and find the one that best suits your needs. Mortgage rates hover around the national average in the Gem State. Idaho is larger than all of New England but it’s also one of the least populous states in the country. Four Idaho counties have conforming loan limits over $453,100. No mortgages found. Please change your search criteria and try again. Idaho mortgage rates are roughly equal to the national average. Idaho real estate is a bit more expensive than the rest of the country in recent years. The national median price of listed homes is $268,500 according to Zillow. Idaho’s is $289,900. Most counties in Idaho have a conforming loan limit at the standard $453,100; however, three counties, Blaine, Camas and Lincoln, have a limit of $625,500, and one county, Teton, has a limit of $679,650. This is a reflection of the higher average real estate prices in those counties. FHA limits in Idaho stick to the average $294,515, with exception of the same four counties with increased conforming loan limits. Idaho is a deed of trust state, meaning when you take out a home loan in the Gem State you’ll likely get a deed of trust instead of an actual mortgage. Lenders who issue mortgages have to go to court to foreclose on the home that the mortgage applies to. But if a trust deed is offered instead, a lender can initiate a power of sale foreclosure by hiring a third party to auction the home it wants to sell, bypassing the court process. Idaho has some lax disclosure laws for sellers, so it’s important that buyers be vigilant when considering a property purchase. The best course of action is to arrange a property inspection with a well-trusted inspector or company. This is particularly critical when disclosure laws are not as strict as they are in other states, as is the case with Idaho. Fixed-rate mortgages are the tried-and-true home loan option for buyers. For people who plan to stay in their new home for a considerable period of time, a fixed-rate mortgage may be especially attractive. The most common type of home loan is a 30-year fixed-rate mortgage. With this mortgage you have three decades to pay off the loan and the interest remains the same for the duration of that period, unless you refinance. Another option for Idaho buyers is a 15-year fixed rate mortgage. This loan comes with a lower interest rate but the monthly payments are higher. The average Idaho rate for a fixed-rate 30-year mortgage is 4.7%. Idaho homes are less expensive than the average U.S. home, so it makes sense that the conforming loan limit is about average in almost the entire state (except the four counties mentioned above). A jumbo loan is a loan that exceeds the conforming loan limit. For example, a $600,000 loan in Gem County where the limit is $294,515. These oversize loans are accompanied by higher interest rates. Banks take on a bigger risk when issuing large loan. The higher interest is meant to offset that risk. The average jumbo loan rate in Idaho is 4.0%. An adjustable-rate mortgage (ARM) stands in contrast to a fixed-rate mortgage. Unlike a fixed-rate mortgage, an ARM’s interest rate can “adjust” or change over the period of the loan. Typically an ARM will offer a lower introductory interest rate as compared to a fixed-rate mortgage. That initial period lasts somewhere between one and 10 years. At the end of that period, the interest rate will usually rise. The terms of the loan will spell out how many times the rate can rise and the highest possible level that it can reach. The average rate for an ARM in Idaho is 4.4%. Looking for mortgage assistance in the Gem State? There are a variety of loan, down payment and education programs in place to help homebuyers along in their process. The Idaho Housing and Finance Association is a sort of one-stop-shop for home financing needs. If you make up to $90,000, you may qualify for one of their loan products, which include low mortgage rates, homeowner classes, down payment and closing cost assistance, and tax credits worth up to $2,000 per year. Idaho First Time Homebuyer is a resource that helps to pair homebuyers with home loan and down payment assistance that will work best for them. As a first-time homebuyer, you’ll have a host of loans and grants you may qualify for. 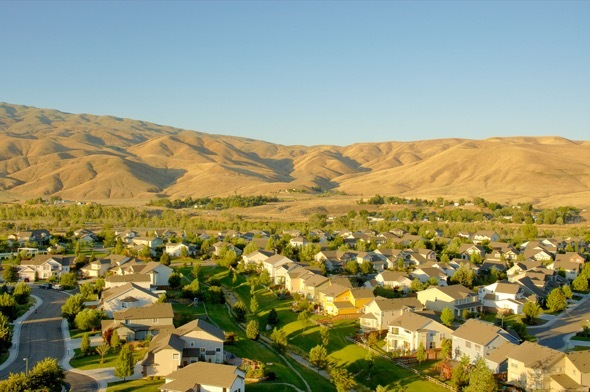 The United States Department of Agriculture Rural Development set up loan and grant programs to help grow rural Idaho communities while offering safe, affordable housing for residents. Loans and grants are available for people looking to purchase a new home or repair their current home, who meet the program requirements. As an Idaho homeowner, you’re allowed to deduct mortgage interest on your state income tax as well as your federal income tax. The Idaho rules for state itemized deductions generally follow suit with federal rules. In Idaho, there is also no tax charged on real estate property title transfers. If you’re refinancing your Idaho mortgage, there are some options to get you started. First, you don’t have to work with the lender who issued your original mortgage (though you can certainly do this). Feel free to shop around and compare refinance lenders to figure out what works best for your particular situation. The Home Affordable Refinance Program of Idaho is a resource that may be available to you. It helps qualifying applicants gain access to interest and principal payment reductions and low closing costs. Single family homes and condos are accepted. HARP works with a number of different lenders throughout the state. The Idaho Housing and Financing Association also works with homeowners on refinancing their loans. SmartAsset’s interactive mortgage map highlights the best counties in the country (and in each state) for securing a mortgage. Hover over counties and states to see data points for each region, or use the map’s tabs to view the top counties for each of the factors driving our analysis. Methodology For many people buying a house means securing a mortgage. To determine the best places in the country to get a mortgage we looked at four factors: overall borrowing costs, ease of securing a mortgage, cheap property taxes and cheap annual mortgage payments. To calculate the overall borrowing costs, we looked at the expected costs over the first five years of a $200,000 mortgage with a 20% down payment, including closing costs. We calculated the ease of getting a mortgage as the ratio of mortgage applications to actual mortgage originations (secured mortgages) in each county. We based annual mortgage payments on the annual principal and interest payments for a $200,000 loan in that location, using average mortgage rates in each county. Finally, we ranked locations based on these four factors, and then averaged those rankings, giving equal weight to each factor. The areas with the lowest average rankings are the best places to get a mortgage.